Nil-Cor butterfly valves feature a double-offset disc design normally found only on expensive high performance types. This design allows the disc to move off the seat with a "camming" action, reducing break-away torque and seat wear. The 360° uninterrupted disc seal eliminates the leak path at the shaft hubs found on PTFE and rubber-lined competitors valves. A super-strong 17-4 ph shaft encapsulated with graphite reinforced vinyl ester resin eliminates corrosion and assures long trouble-free operation. Nil-Cor uses premium epoxy novolac vinyl ester resin and a special blend of fillers, reinforcement and curing agents to produce an inherently corrosion resistant valve. Without the need for expensive liners that eventually swell or permeate, Nil-Cor valves deliver a long, maintenance-free service life. External corrosion is a leading killer of lined metal valves but Nil-Cor’s vinyl ester body and Hastelloy® hardware can stand up to just about any nasty environment on the planet. 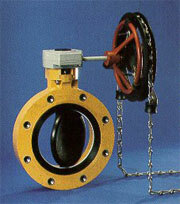 Nil-Cor butterfly valves weigh less than 1/3 that of similarly sized metal valves. This means reduced handling and shipping expenses and easier installation. So forget old-fashioned iron butterfly valves and crack-prone plastic valves. Go with the leader—the rugged advanced composite butterfly valves from Nil-Cor! The Nil-Cor Series 300/310 double-offset disc design allows the disc to move off the seat with a "camming" action, reducing break-away torque and seat wear. The 360° uninterrupted disc seal eliminates the leak path at the shaft hubs found on PTFE and rubber-lined valves. A strong Stainless Steel shaft encapsulated with graphite or fiberglass-reinforced vinyl ester resin eliminates corrosion and assures long trouble-free operation.